As a family, one of our favorite times is playing games together on family game night. SmartGames recently sent me three awesome ones to try out. One is perfect for my younger son (but it also a brain teaser for my older son too), and the other two are fun for my older son as well as us. Each of these games are challenging games that really make you think. I love the idea of these being brain twisters so much that I decided to give me older son extra tablet time in exchange for completing one of the game challenges. This is a win win because he loves the challenge, and it feels more like fun than a chore but he is also stretching his mind! This is basically a puzzle, but it is a 3D puzzle. You look at the picture and you put the blocks together on the car to fit the picture. For the younger children it shows all angles of the way it is supposed to be. For older children and adults it only shows one angle so it leaves you guessing. This is a very well made puzzle. The blocks are all wooden and the car is fun to play with without using it the way it was meant to be. We have ALL spent hours of fun trying to figure this one out! Another great one that the kids really have to think about and plan their strategy. My younger son (3) really wants to get his hands on this one because it is dinosaurs, but it is just too complicated at his age now. This game uses visual perception, concentration and planning to keep the carnivores from the herbivores. This one has proven to be very difficult for my nine year old son because he has ADHD and his concentration is not always the best, however, he really likes this game and mommy loves that it offers a fun challenge to him! I have not been able to get a good picture of my nine year old playing this game because he keeps it in our car and plays on the go. 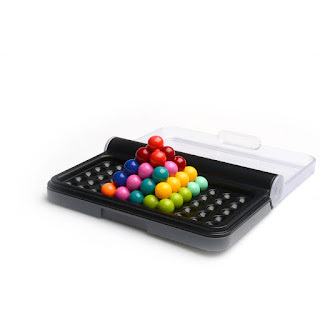 This is a great brain teaser to play traveling because it comes in a magnetic case for car play. There are three ways to play it, so it makes up 120 different scenarios to play. All of these games are awesome Christmas presents and the IQ Puzzler Pro would make an amazing stocking stuffer! I know for many of you its too early to be thinking about Christmas, but I am in full planning mode here! These challenging games are fun, but also help stretch your little ones mind. They are truly the perfect "toy" for parents who love educational items for their kids.